Social Check - Is the name still available on social networks? Check the availability of your name in social networks and other internet portals - with only one click. If you want to use social media marketing for your new business or product - and who doesn't, nowadays? - you should make sure that your name idea has not already been claimed by someone else on the most important social media sites. Remember, you do not necessarily need to set up profiles on each social network. If you are a b2b company, you'll probably be more insterested in the "big ones" like LinkedIn, Twitter or Facebook, whereas as a freelance artist, you should also take a look at DeviantArt or Flickr. In any case, consider registering your (company) name on different portals, because if anyone else snags it, you have no control over what happens under your name. NameRobot checks whether the name is available as username (e.g. Twitter) or as a custom vanity URL, e.g. www.facebook.com/yourname. 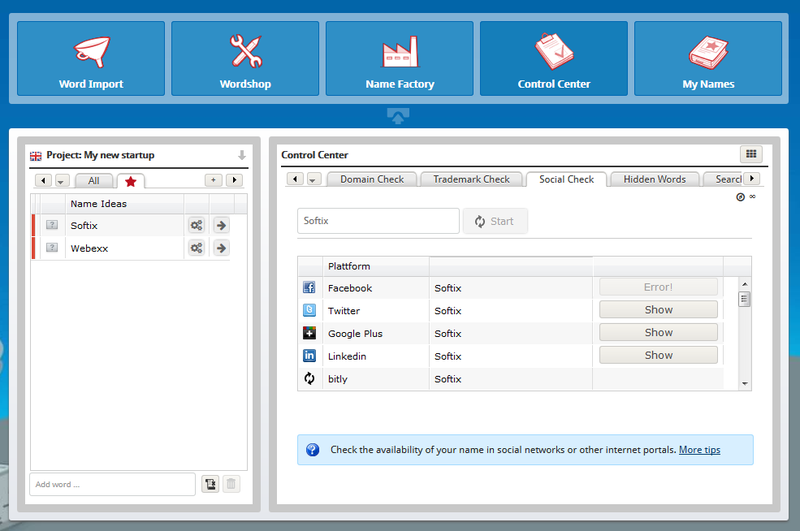 Check the availability of names in various social networks with one click. Go to the Social Check in the Control Center right now to test it out! If you don't have a NameRobot account yet, simply register and start looking for a name!